Andre Ayew hinted on Monday that AC Milan's Ghanaian midfielder Kevin-Prince Boateng would return to the Black Stars sooner than expected. Boateng announced his retirement from international football in November last year, saying that he was physically torn between club and national team commitments. 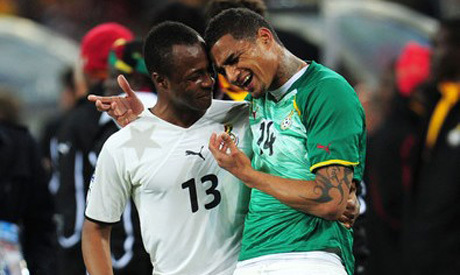 Ghana coach Kwesi Appiah said earlier this year he was aiming to pressure Boateng into changing his mind. However, his efforts are yet to bear fruit. ''I have had discussions with him, but we need to give him time,” Ayew was quoted as saying by Ghanasoccernet. "I know and I believe he will be in the Black Stars soon." "People say a lot of stuff about him and they don’t know him very well and it is due to such things that he has not returned, but he will come back soon," he added. The 25-year-old midfielder, who played for Germany's youth teams, made his Ghana debut in a friendly game against Latvia on 5 June, 2010.